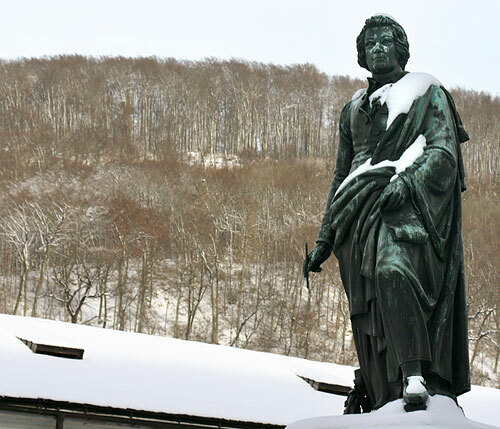 The Mozart memorial at the centre of Salzburg (on Mozartplatz), looking bleak and boring. In fact, Mozart plays a minor role in the musical activities at Christmas: Noteworthy cultural events of the winter include the Salzburger Adventsingen, which is done in traditional costumes and is more of a folk culture event than Classical Music; smaller concerts and musical performances are generally rather of the folkish kind, too. And even the Salzburg Easter Festival, the first big music event after winter is primarily dedicated to Baroque music, with Mozart playing only a minor role. All that doesn't harm the great man of Salzburg at all: He is omni-present all year round, be it in merchandising or in the touristy concerts that are held in various locations of Salzburg every day.